Rachel has traveled mostly among the Black H’mong this week and shared pictures of them and some of their life. The Black H’mong have received a lot of Christian influence in the past and there is a high number of Believers among them. Some estimates place the number of Believers among the Black H’mong to be more than 10%. This area of northern Vietnam however is covered with many other ethnic groups, many of whom are ‘unreached’ as well as those that are unreached and unengaged (no one is working to plant churches among them). 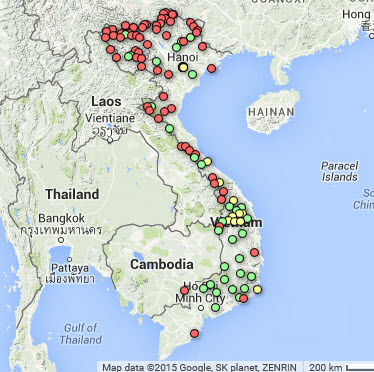 The Joshua Project estimates as many as 68 ethnic minority groups in Viet Nam to be unreached. Most are in the north or along the western mountainous ridge — all difficult places to get to. Locations of many of these upgs are indicated by red dots on this map from the Joshua Project. Pray for Believers and churches among the Black H’mong to grow in their faith. Pray for strong Biblical teaching and discipleship among these churches. Pray that these Believers will actively engage others in their people group who have not yet believed and share the Gospel with them. Pray that Believers among the Black H’mong would have a vision for reaching the unreached peoples that surround them. Pray for opportunities at local markets to share the Gospel across ethnic lines. Pray for God to call out laborers to work among the UPG’s and UUPG’s of Viet Nam. Pray that Vietnamese Believers will rise up to take on this calling and responsibility. Pray for Believers and churches from outside Viet Nam to hear and respond to God’s call to reach the many people groups in Viet Nam and the mass of lostness in this country.